Boston is the most energy-efficient large city in the U.S. for the third time running. The ranking comes from the American Council for an Energy Efficient Economy’s third biannual City Energy Efficiency Scorecard. ACEEE is a nonprofit focused on research, policy and advocacy around energy efficiency in the public and private sectors. The scorecard ranks the 51 largest U.S. cities based on five criteria: local government operations, community-wide initiatives, building policies, energy and water utilities, and transportation policies. During the Wednesday launch of the new scorecard, ACEEE staff and city mayors emphasized the critical role cities must play in advancing environmental sustainability, both because of their outsized impact and the shifting political climate. Boston slotted into first with a score of 84.5 out of a possible 100 points. The city scored high for the efficiency of their city operations, for their enforcement of the Massachusetts Stretch Energy Code, a stricter energy standard adopted by the state in 2009, and their Building Energy Reporting and Disclosure ordinance. The city also earned a perfect score for having energy-efficient public utilities and for the Renew Boston program, which helps residents and businesses implement energy-saving measures. New York and Seattle rounded out the top three with Los Angeles and Portland, Oregon, tied for fourth. New York and Seattle both scored high for transportation and building energy codes and benchmarking requirements. The scorecard weights the five categories by potential energy savings. For example, transportation gets the most points because it often accounts for a city’s greatest energy consumption. In a sample of 20 large cities, the ACEEE found that transportation-related energy use accounted for 36 percent of citywide energy consumption. 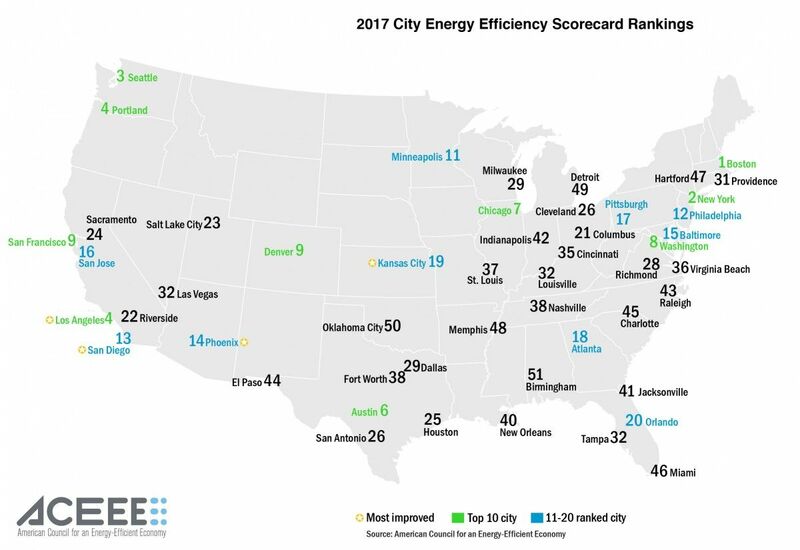 On the other end of the scorecard, Detroit, Oklahoma City and Birmingham, Alabama, were least energy efficient among their peers. Oklahoma City and Birmingham scored just 8 and 7 points respectively out of the possible 100. ACEEE is concerned with city energy consumption precisely because cities consume so much energy. Though urban areas are environmentally friendly because their population density reduces per-capita energy consumption, a study found that cities around the globe account for two-thirds of the global energy demand and 70 percent of energy-related carbon dioxide emissions. Officials who participated in the scorecard process say it will be up to cities to take the lead on sustainability and energy consumption. “Now more than ever I think cities are going to lead the way on climate change,” Boston Mayor Marty Walsh said at the launch. Phoenix Mayor Greg Stanton said that, from his experience leading a blue city in a red state, state legislatures have become a barrier to action. “When Phoenix tries to pass strong progressive policy on climate change, we do so in an environment where our state legislature tries to preempt us,” he said. Despite that, Phoenix has set lofty sustainability goals to accomplish by 2050, part of the reason the city was among the most improved from the 2015 ranking. The city’s sustainability plan sets a goal of zero carbon emissions and zero waste by 2050 and a 40 percent greenhouse gas reduction by 2025. To get there, Phoenix is doing things such as converting streetlights to LED, retrofitting government facilities to get a 25 percent reduction in energy consumption by 2020, and investing in transportation infrastructure.